Born Nov. 10, 1925, in Everest, Kan., Rosemary entered Highland Community College at the age of 16. She subsequently attended the University of Kansas where she met pre-medical student Joe Pierron. She claims the two often would sneak off together to wander through the underground steam tunnels on the KU Lawrence campus. As money was scarce, for entertainment they would sit on the benches outside the student hospital to watch the clouds change shapes. Rosemary and Joe were married June 29, 1946 in Kansas City, Mo. at St. Stephen’s Catholic Church. Upon Joe’s graduation from the University of Kansas Medical School, the two developed a love of travel. Rosemary was smitten with Monterey, Calif; Joe was not. Joe grew homesick for Kansas City. The always outspoken Rosemary accepted her husband’s decision with the rebuke: “Darn your buttons!” The couple returned to the Kansas City area and settled in Olathe, where Joe joined Dr. C.W. Jones in General Practice. Rosemary and Joe would later spend several years touring Europe during Joe’s enlistment in the U.S. Army. They went to Europe with 4 children, returned with 6 and subsequently were blessed with three more. 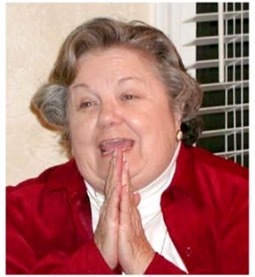 Rosemary was an enthusiastic member of St. Paul’s Catholic Church, Olathe where she was a room mother for nearly 20 years. She was active in the church’s Altar Society and Parent Teacher Organization. She belonged to the Chrysantas Club and Culture Club in Olathe and served as a volunteer for the Olathe Red Cross and Olathe Medical Center. She was a Republican Party precinct committeewoman and precinct election judge. Rosemary applied similar energy and imagination to her passion for garage sales, antique shopping, dinner parties, and playing bridge. She adored Frank Sinatra (After attending a Sinatra concert she returned home to announce that he sang, “I Got You Under My Skin” while pointing directly at her. No witnesses came forward to refute the story.) She loved gardening, yellow roses, European travel and vacations on Cape Cod. More than anything, she loved babies. Grammy was the quintessential grandmother, available for sick children with a made up couch and lunch tray. No one left her home hungry. George Joseph Pierron, Jr, and wife, Diana, Lawrence; Michael Pierron and wife, Ardis, Spring Hill; Donald Pierron and wife Judy, Frisco TX; Dr. Mary Lou Pierron, Needham, Mass; Thomas Pierron of Houston, Texas; Dr. Kathy Chartrand, Olathe; David Chartrand, son-in-law, Olathe; Richard Pierron and Lori Winningham, Olathe; Patricia Beavin and husband, Bill, Webster Groves, Missouri; Nancy Reynolds and husband, Eric, Overland Park. Twelve grandchildren: Sam, Abby, Dan, Alex, Teddy, Tim, Max, Matthew, Ava, Rose, Laura, Matthew and four great-grandchildren: Charlie; Amy, Ari, and Autumn Grace. She also is survived by a sister, Fern Nettleton, Lawrence, Kan., and two sisters-in-law: Maxine Pierron, Kansas City, MO; and Dee Williams, Colorado Springs, CO. Many nieces and nephews also grieve Rosemary’s passing. The Pierron family wishes to thank Dr. James Ruhlen, the Good Samaritan Nursing Center and Olathe Hospice for their loving care. Very special thanks to Ms. Connie Riggs, Rosemary’s caregiver and close friend of 40 years. The family requests donations to the Good Samaritan Center of Olathe and Olathe Hospice. Condolences to the family, losing a mother has a particular sting even when you are aware of the pending loss.Sounds like she had a wonderful life.Sorry to read here also about the loss of Amy, I worked at the hospital from 85-95 and she always was like the sun coming through on a cloudy day, just a natural light to be around regardless of what was going on around her – a lot like Dr. Chartrand. Peace be with all as they heal the void being left.